Subscription-based home delivery beard club The Beard Club asks you if you “ever wonder what you would look like with a beard” in its latest commercial. The 20-second ad features a wizard who urges viewers to gaze upon his balls if they want to see what they would look like with a beard. 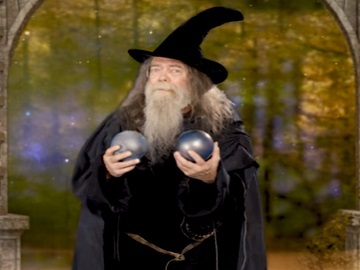 Holding two purple balls, the long-haired and bearded character, who’s wearing a black cape over black clothes and a black wizard hat, asks viewers to wonder no more, since they can have the answer to this question thanks to the spherical items. As a young man with beard is seen looking at himself in the mirror, the wizard’s voice is heard telling him that his beard suits him well. “Time to grow, brother,” he also says, looking at the camera and showing the two balls. “Ok, stop looking at my balls,” he then adds as if he were suddenly ashamed by the objects in his hands. The idea of asking people to take a look at balls was also used by Jack in the Box earlier this year. Jack, the mascot of the restaurant chain, starred in a commercial promoting the new teryaki bowls and asked viewers, in various ways, to try them, while holding two teriyaki bowls. The spot, which includes a naughty play on the word “bowls” in a way that brings to mind the male anatomy, was met with a media backlash. In its previous “Born to Grow” campaign, The Beard Club highlighted that “You were born to grow” and invited people to maximize their growth and discover their untapped bearded potential. The Beard Club provides a series of kits (The Starter Kit, The Advanced Kit, and The Legendary Kit) containing various products designed to help you get a “softer and smoother beard”, that are delivered monthly to your door. The offering includes all-natural products, oil, balm, wax and more, growth accelerators, as well as beard gear and apparel. Customers can build a kit based on their own necessities, choosing an all-natural beard oil, products from the Essentials range, shower items, accelerators, such as growth vitamins as spray or capsules and/or growth oil, and accessories, such as a beard brush or comb, a stainless comb and/or a sandalwood mustache comb. Next: Sandals Resorts Commercial: What Is Luxury?